In early 2000, the heaviest rains in 50 years coupled with a major cyclone swept across southern Africa leading to three weeks of severe floods which devastated south and central Mozambique. Those who fled the rising waters returned to their villages only to face new problems. Waterborne diseases, like malaria, were rife. Children lost at least six months of school. Many families returned to find their land occupied by others. With nearly all records washed away there was no way to re-establish ownership. To rebuild any kind of sustainable future, these communities urgently needed reliable information. Recognising that radio is the quickest and most effective way of relaying important messages, the government made an urgent request our wind-up radios. It was important to ensure that even remote communities, without access to electricity or other resources, could tune in to vital information to make informed decisions and keep abreast of weather and news updates. Through the generosity of the United Methodist Church and the British government’s Department for International Development (DFID) as well as private donors, nearly 7,500 Lifeline Energy wind-up radios were distributed to flood-stricken communities. The UK’s Department for International Development (DFID) funded a comprehensive communications initiative, coordinated and implemented by Media Action International. It also funded transmitters to improve reception of radio broadcasts which covered information on health, sanitation, hygiene, agriculture, the location of landmines, obtaining lost identification documents and title deeds and tracing and contacting lost family members. The timely broadcast of this information was vital to displaced communities. Broadcast in the local Shangaan language on Radio Mozambique, the programme was called Ndhambi. Lifeline Energy spent the better part of six months in Mozambique from when the first rains arrived until well after the radios were distributed. At that time, the international relief community did not regard information as as important as food and shelter. However, people desperately wanted information on loved ones, how to replaced lost documents as well as weather reports. In 2001 1,500 additional adios were distributed. Sponsored by the Famine Early Warning System Network (FEWS NET) Mozambique, the units were distributed in collaboration with the Mozambican Red Cross (CVM) in four of the provinces most vulnerable to cyclones and flooding. USAID Mozambique funded an activity called the Mozambique Integrated Information Network For Decision-Making (MIND), as part of its ongoing FEWS NET activity. FEWS NET worked with partners, including government officials associated with communication, meteorology, water and natural disasters to strengthen the early warning systems for floods and cyclones. 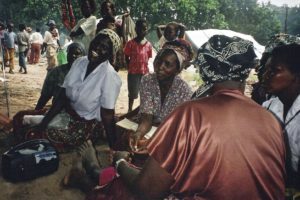 The MIND project, with the co-operation of the CVM, distributed the radios between September and October 2001 in Inhambane, Sofala, Gaza and Zambezia provinces. Lifeline Energy played an advisory role based on lessons learned during the distribution of more than 7,500 radios in the post-flood disaster communications initiative in 2000. Lifeline representatives witnessed the distribution at Nova Mambone, a small town near the mouth of the Save River between Sofala and Inhambane provinces. Nova Mambone had been nearly destroyed by a cyclone in 1999 and it often flooded. The successful distribution of these radios in remote areas within such a short period of time was a tribute to the well-planned and structured methodology of the FEWS NET team. This supports Lifeline Energy’s belief that the success of a sustainable radio communications initiative begins with the structure of the distribution process. We targeted the distribution of radios from the national to the provincial, district and local levels. We compared historical records on floods and cyclones with the Red Cross priority districts for its disaster preparedness activities to identify 25 districts in four provinces to receive the radios. 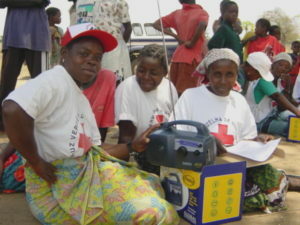 The Red Cross volunteers (locally known as activistas), as well as teachers, traditional leaders and other influential members of the communities were selected to become “guardians” of the radios. The guardians signed a formal agreement confirming their receipt of a radio and undertaking responsibility for the care and maintenance of that radio on behalf of their community. These records assist with monitoring and evaluation of the project. Each community received 20 radios and the volunteers coordinated listening groups. The recipients were trained in the use of the radios and illustrated instructions were provided in six local languages as well as Portuguese. We are very proud to have been part of what we believe to be the first comprehensive communications initiative where sustainability of information was assured in an emergency situation.